The project´s main idea resides in the interaction of the sun with a domo located in New Scotland, Canada. The first step was to find out how the building reacts to sun light in different daytime key moments all year long. The use of a 3d software allows me to figure out which areas would be exposed to sun light and which ones would be into shadow. At that point, I found an area that would always be exposed to light. Due to Canadian cold weather, we need to optimize natural light. The building has a great windows along its whole surface so the house would have natural light inside every day at any time. 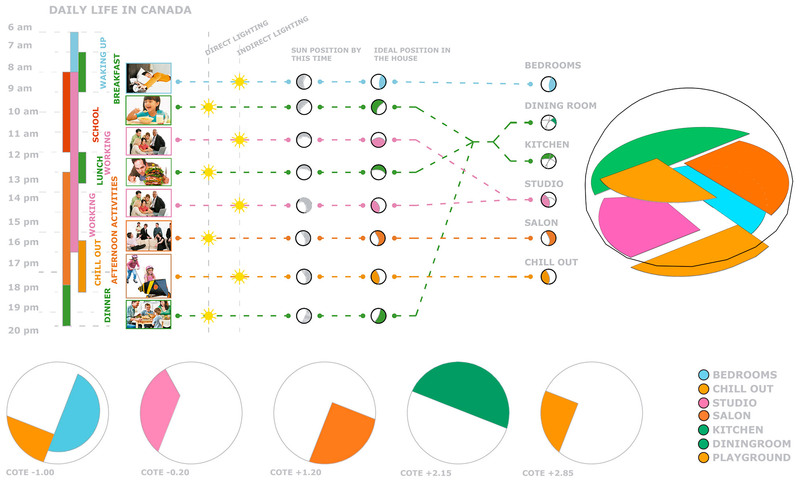 1_Analysis of daily life in Canada: at what time does each activity happens. 2_ classification of Activities: one group with the ones that requires direct illumination, another group with the activities requiring indirect illumination. 3_From the previous analysis, I see the sun position in relation to the Solar House by the time each activity takes place. 4_Interior distribution according to the sun position and the kind of illumination each activity needs. great open space with multiple platforms at different levels creating an internal landscape. These platforms are organized by sun incidence but also by the function they contain. The passive activities, such as sleeping, studying or reading, are on ground level. 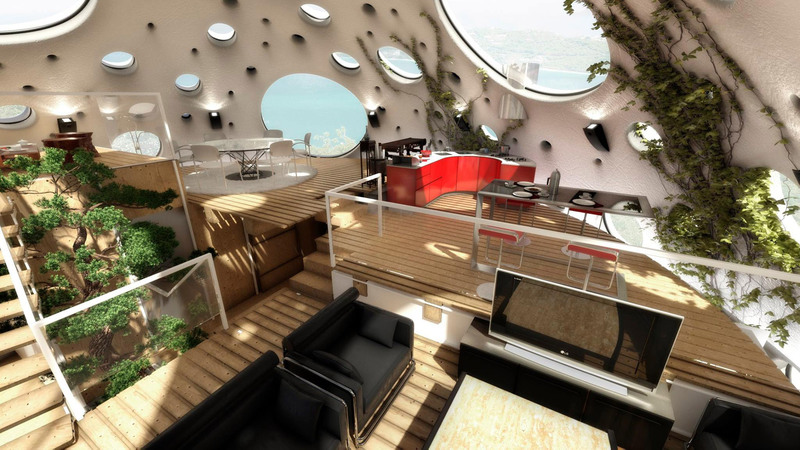 The more dynamic activities, such as social life, cooking or playing, take place in the upper levels. By this logic, the ground levels also search a bigger degree of privacy and self space, while the top levels are totally open to each other, creating a great swarm space where the members share all their activities and from each point you can check what it is going on in the full house. 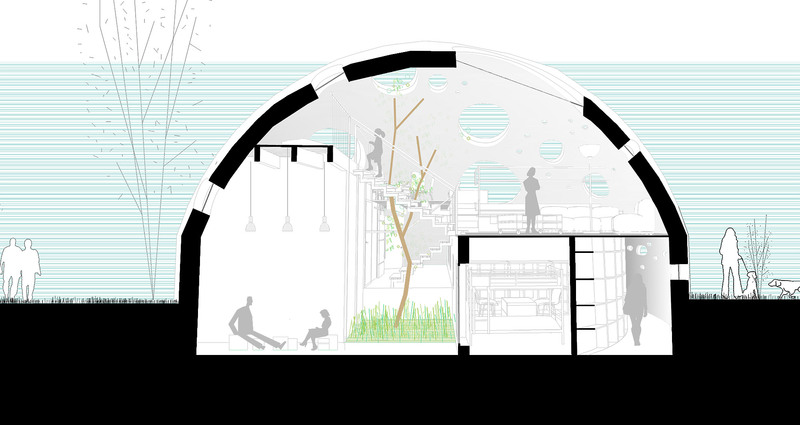 One of the main goals of the proposal it is to create spatial diversity into the dome shell. 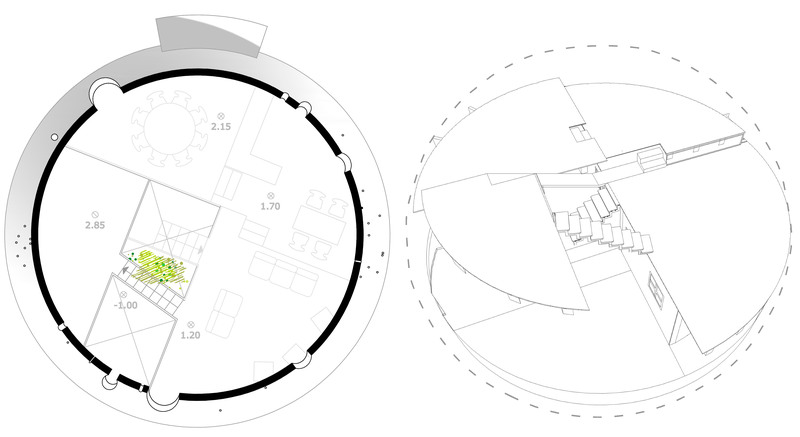 The circle typology invites to centrality and to a radial space. The project aims to produce multiple situations, multiplicity of view points and heights. For social interaction it is mandatory each member is able to find spaces where differentiate his situation and point of view from the others. The homogeneity and deprivation of self singularities incapacitates the individuals to develop in society. With this goal, the house becomes a great theater for daily life. 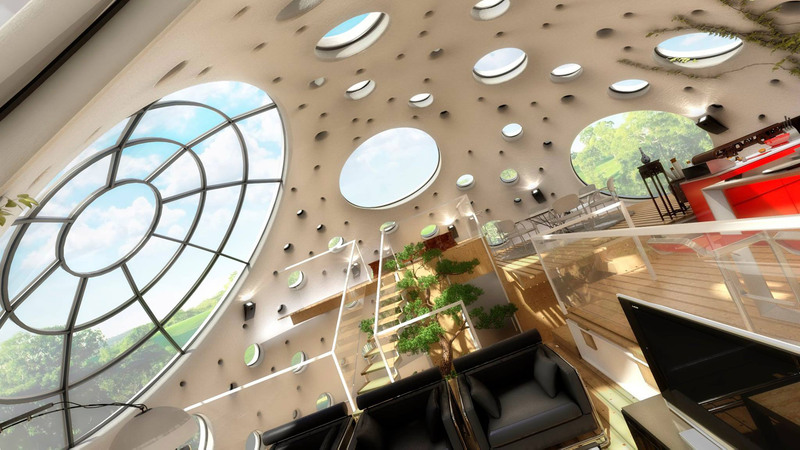 All the available space of the dome participates into this function. 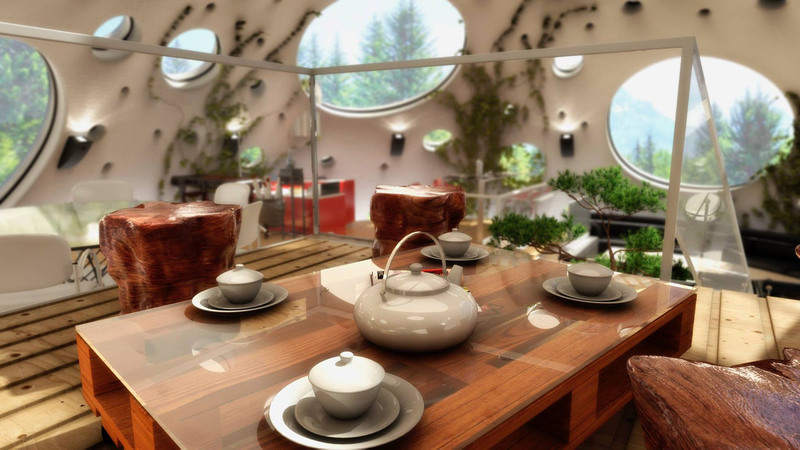 The Dome becomes a great container of life, a background where people, their actions and personal objects become the main characters of the house.